Plovdiv launches free guided tours in English. Free guided tours in English will be offered to all guests of Plovdiv. 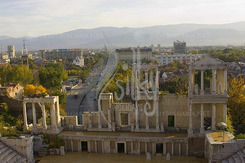 The initiative Free Plovdiv Tour will start on Friday in front of the tourists centre in the central part of the town. The tours are completely free. The tours will be offered all year round from 6.00 PM and will take around two hours. The route starts from the central post station and passes through the Odeon along the way to the Old town. The free Plovdiv Tours is a project of a non profit organization, which also offers free guided tours in Sofia and Varna. The organizations aims to develop a positive outlook of Bulgaria as a tourist destination. The initiative is also supporting the candidature of Plovdiv for European capital of culture in 2019.
over 15 000 guests from over 105 countries attended the tours from its first launch in Sofia and Varma. Volunteers from Veliko Tarnovo also plan to launch similar tours, inspired by the idea.